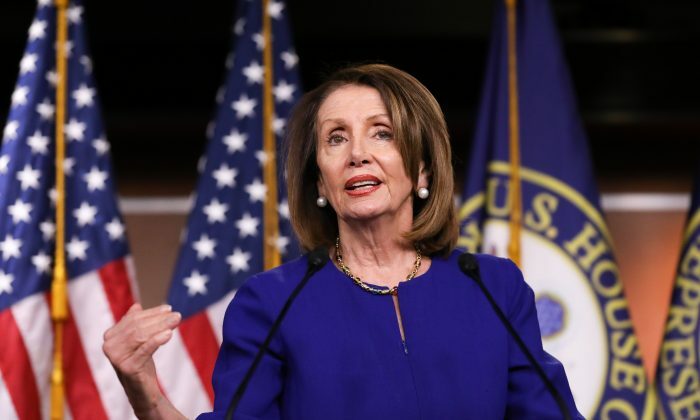 WASHINGTON—Among Nancy Pelosi’s first moves as Speaker of the House was to create the Select Committee on the Modernization of Congress, with six members from each political party and chaired by Rep. Derek Kilmer (D-Wash.). But making the House more transparent—and thus more accountable to voters—got lost somewhere along the way between the November 2018 election that restored Democrats to the majority for the first time since 2010 and the official House rules adopted Jan. 4, that created the select panel. Thirty House members—including Pelosi, House Majority Leader Steny Hoyer (D-Md. ), and House Minority Leader Kevin McCarthy (R-Calif.)—testified at the committee’s first hearing on March 12. Davis also pointed out that taxpayers who view such records have to identify themselves. “I believe it is simply good government to let the public view the franked materials they’ve paid for without being asked for personal information about themselves,” she said. Rep. Lauren Underwood (D-Ill.) was the third member to mention transparency, as she encouraged the committee to consider her proposal to require the House Ethics Committee to make its reports public. Others among the 30 testifying at the hearing recommended things like improving the design of congressional office buildings and furniture (Rep. Dean Phillips, D-Minn.), paying higher salaries to congressional aides (Rep. Bill Pascrell, D-N.J.), and convening a bipartisan congressional retreat to encourage more harmony among members. Another, Rep. Bill Foster (D-Ill.), even proposed restoring anonymity to members who sign discharge petitions, which are a legislative tool for forcing a recalcitrant committee chairman to send a bill to the full House for a vote. House rules have required signers’ names to be made public since 1993. Political strategists from across the ideological spectrum expressed disappointment with the committee’s early performance. “The entire scope of the purposes of the committee is subject to potential abuse unless its work is done with great transparency,” warned Mark Fitzgibbons. Fitzgibbons is president of corporate affairs for American Target Advertising, the political strategy and communications firm based in Manassas, Virginia, and founded by direct mail fundraising pioneer Richard Viguerie. “And just as much as the executive branch and administrative state should be open to transparency under Freedom of Information Act (FOIA) requests, it is time to ensure Congress is subject to the same—or even greater—level of legally compelled transparency, and make FOIA apply to the first branch,” Fitzgibbons suggested. The FOIA was approved by Congress in 1966 and signed into law by President Lyndon Johnson, but the representative branch has never been subject to the law. Democratic strategist Jimmy Williams said members of Congress should be required to make their tax returns public.